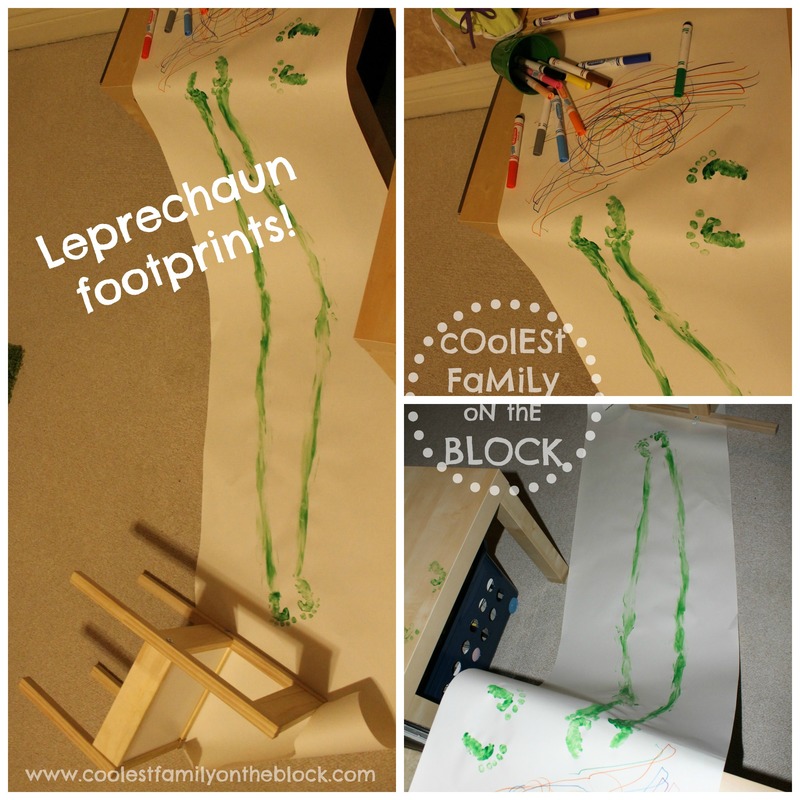 Leprechaun Trickery is Afoot: Little Green Leprechaun Footprints! On 2/21/2014 an old unwatermarked photo from this post had been pinned and shared unsourced on a Facebook page with over 11 million followers and I received no credit. I would appreciate you sharing this post, particularly on Facebook and Pinterest, in an effort to get a credited/sourced version of the photo out 🙂 Read more. 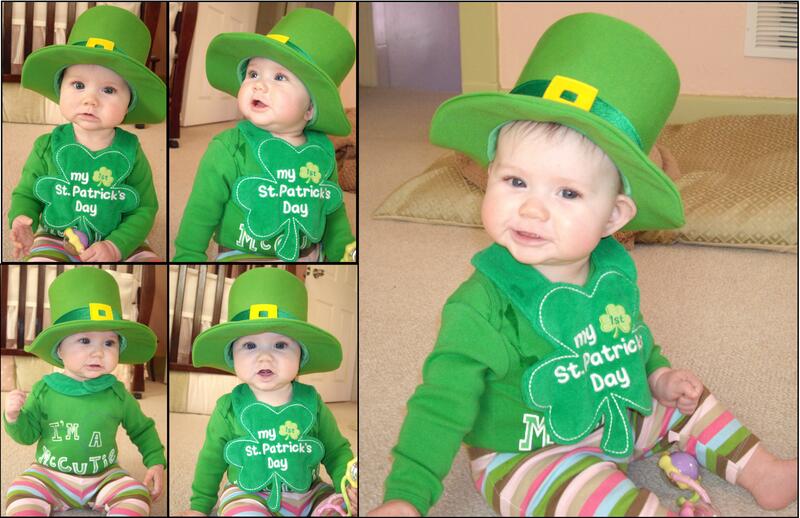 On St. Patrick’s Day I set up a small Leprechaun breakfast for Adaline. 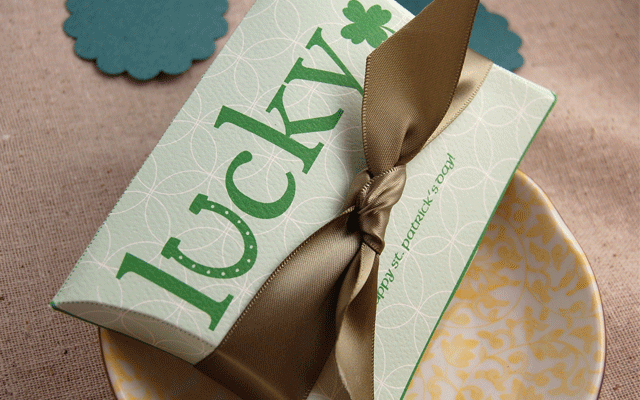 I set out teeny-tiny pancakes on small plates and a box of Lucky Charms. 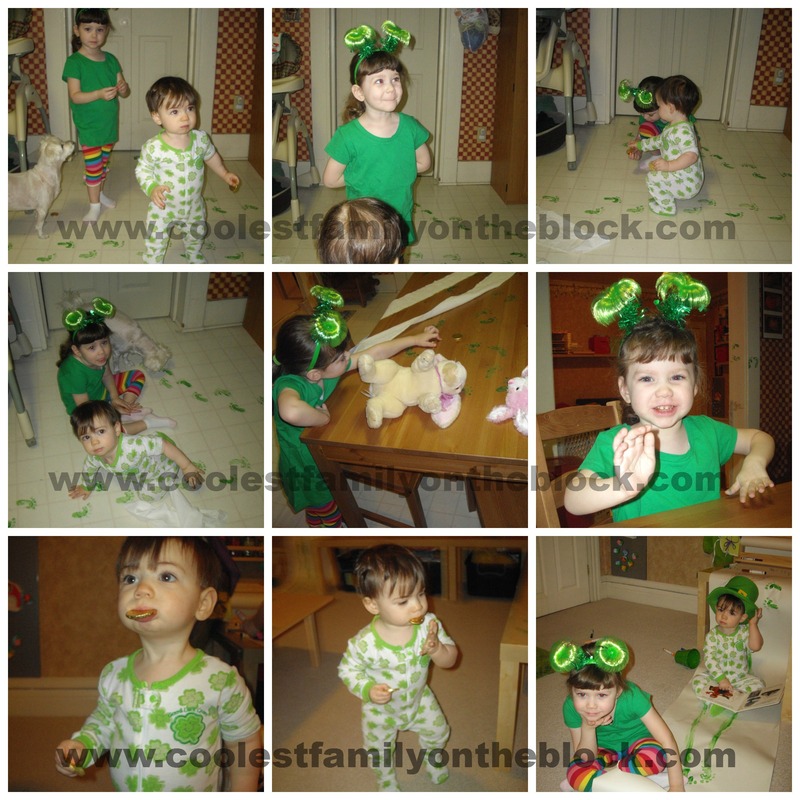 I used Adaline’s Leprechaun hat from last year as a centerpiece (it was too small for her this year 😦 ) and set out the green tablecloth and green plates. Once the table was set I went upstairs to get Adaline and Cool Daddy for breakfast. I wasn’t upstairs for very long so imagine my surprise when we all found this mess in the kitchen. 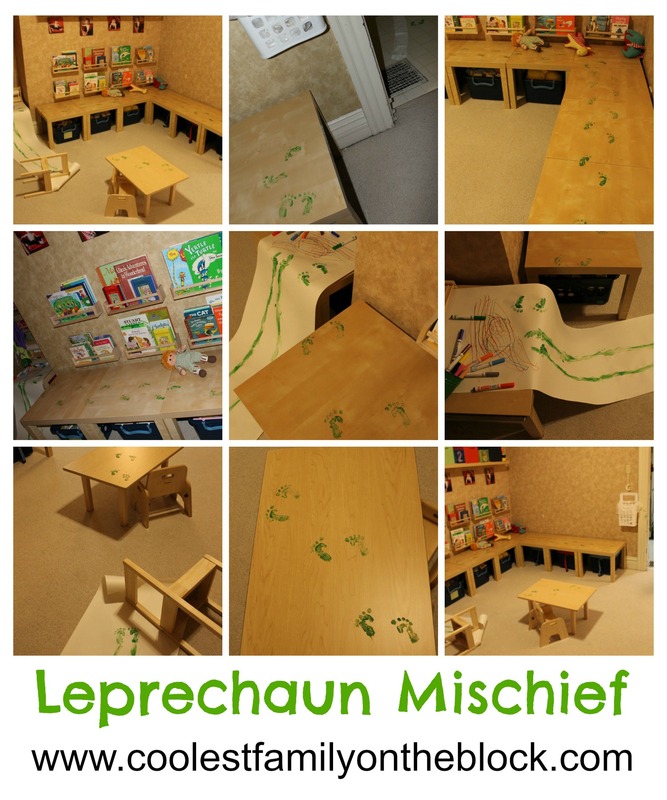 In the short amount of time that we were upstairs we must’ve been visited by a tricky little Leprechaun! 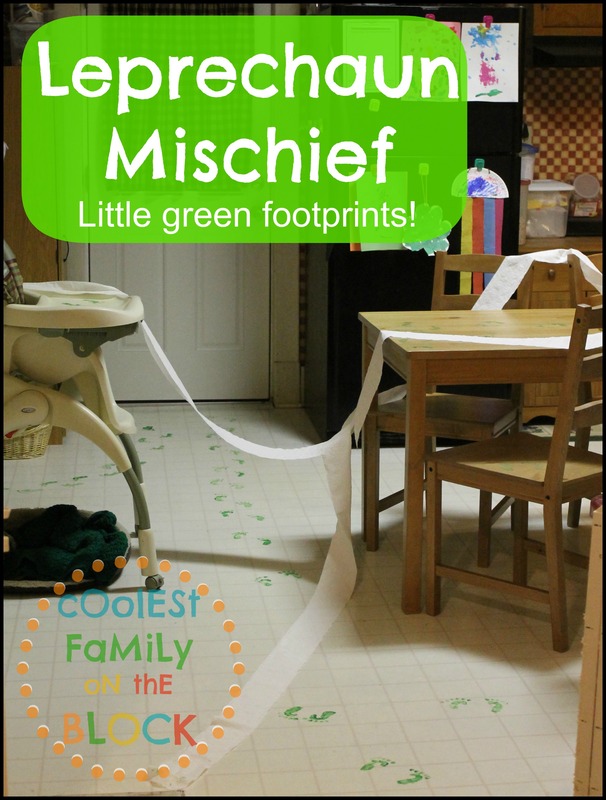 He/she left his little green footprints all over the kitchen and laundry room. 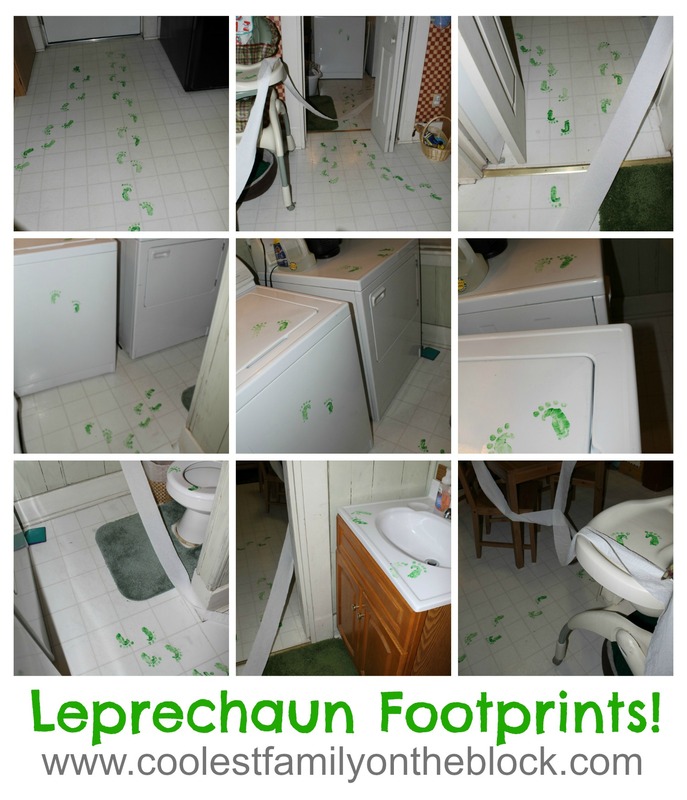 The leprechaun came inside from the back door then he/she walked into our laundry room, hopped up on the toilet and turned the water green! 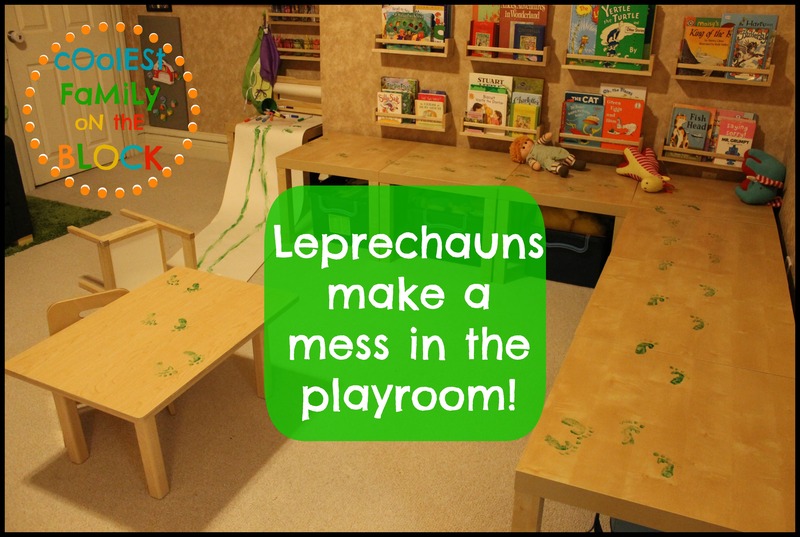 Next the leprechaun left the laundry room, went back into the kitchen and hopped up on top of the table (I hear that Leprechauns are excellent hoppers!). 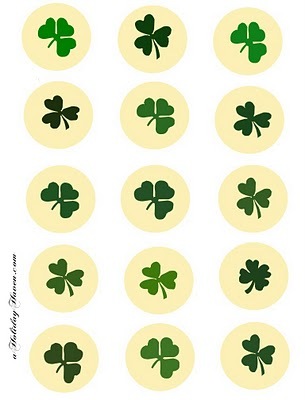 Once on the table the Leprechaun took the stacks of mini pancakes and shaped them like clovers. He/she left some chocolate gold coins for us, but not before taking a bite out of one of Adaline’s pancakes! 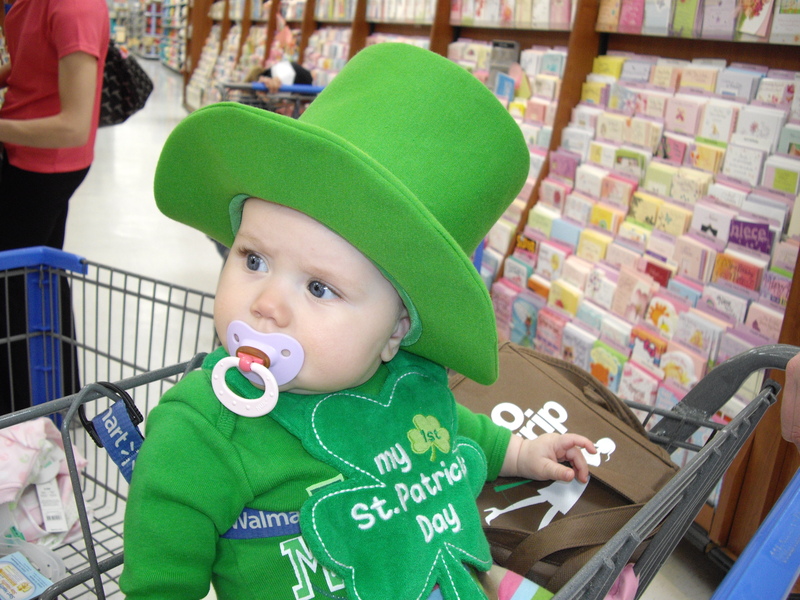 He/she then got inside of the box of Lucky Charms (making a big mess!) and came back out with some to eat. 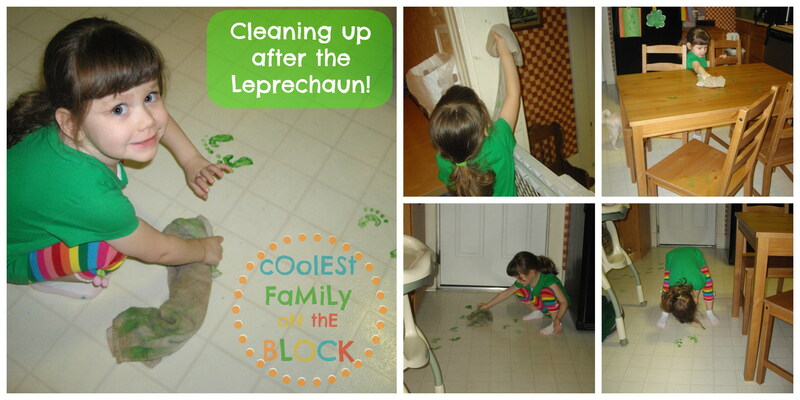 The Leprechaun then hopped down from the table and walked up our refrigerator! He/she must’ve gotten inside of the fridge and then walked back down the side of the fridge and out the back door. 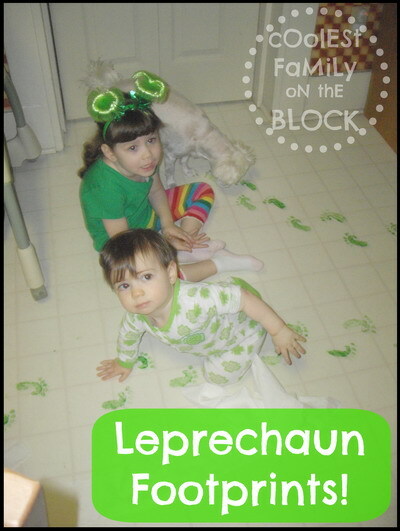 The Leprechaun must’ve been eating Lucky Charms this whole time because we found them on the floor, in the fridge, and on the way out of the back door…they managed to eat all of the marshmallows, though! 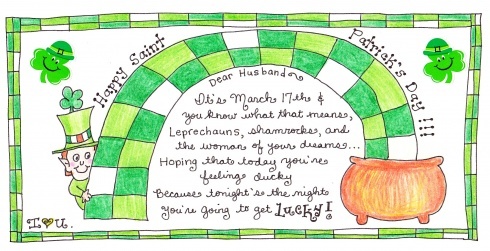 At first glance I really wasn’t sure why the Leprechaun went into the fridge since everything seemed okay in there. 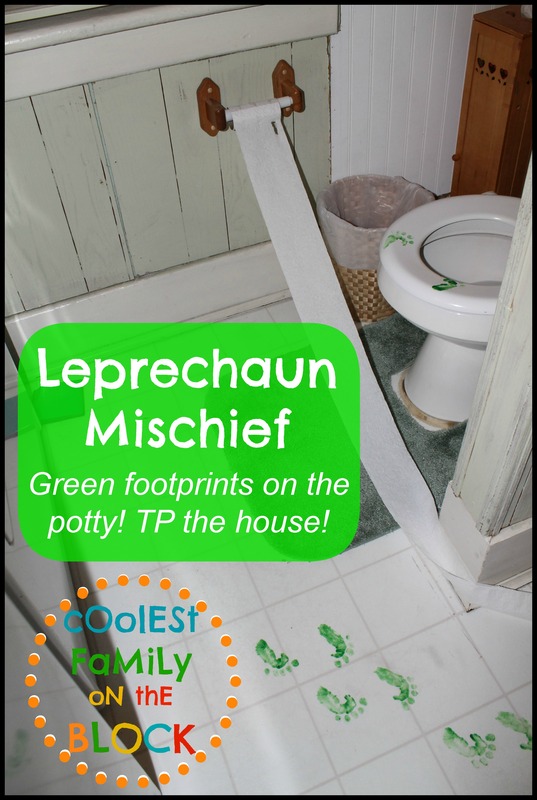 Our milk appeared normal but when I poured our milk it turned green in the glass…that tricky Leprechaun! Cool Daddy made me try the green milk first. It tasted normal to me, it was just…green. Cool Daddy did finally drink the milk, but he wasn’t happy about it being green. …she was happy about the chocolate coins, though! 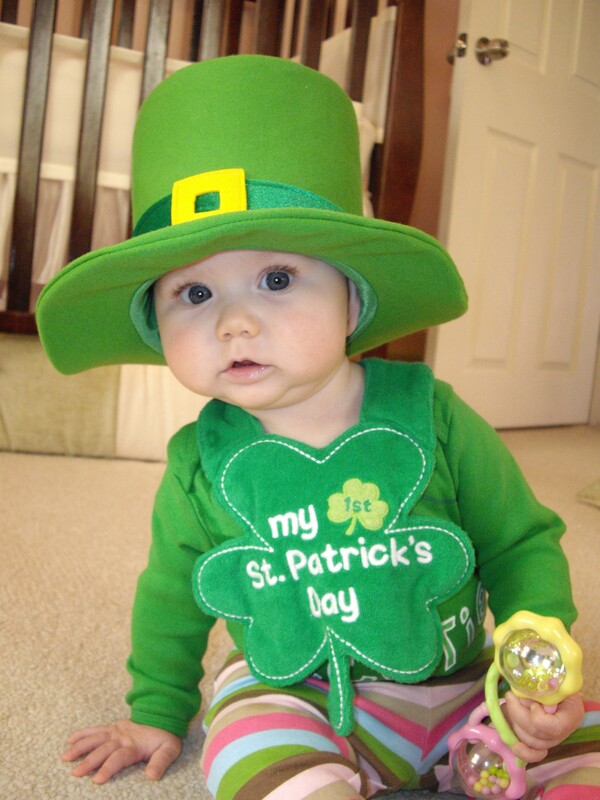 Later that afternoon we all got dressed in our St. Patrick’s Day green so as not to get pinched! Time for a green snack! Green beans, peas, green peppers, cucumbers, green apples, and broccoli with “melted gold” cheese. I tried to make clovers out of the green peppers, but it really wasn’t cooperating, so I tried the cucumbers too. This was the best that I got. Meh. 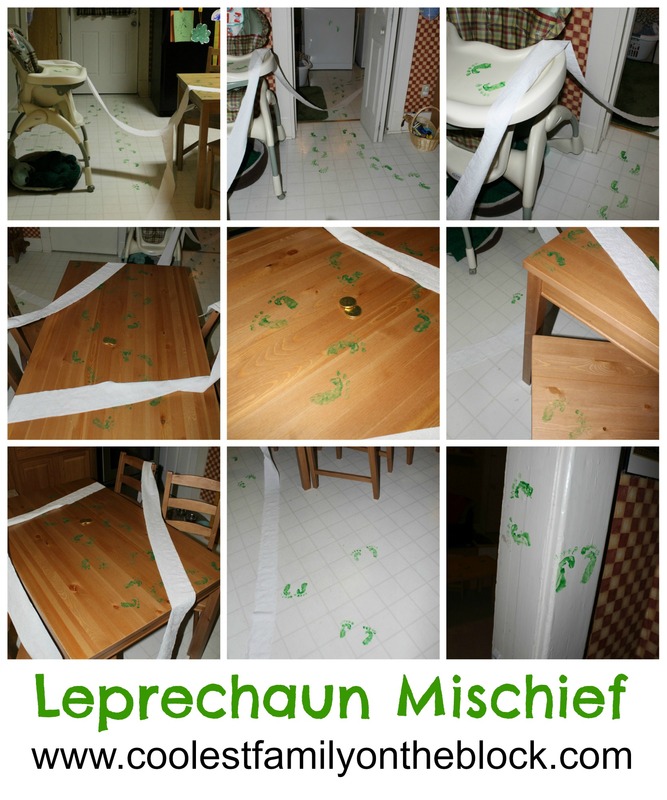 Did a Leprechaun visit your house this year? I’ve included some links below for quick and easy sharing! 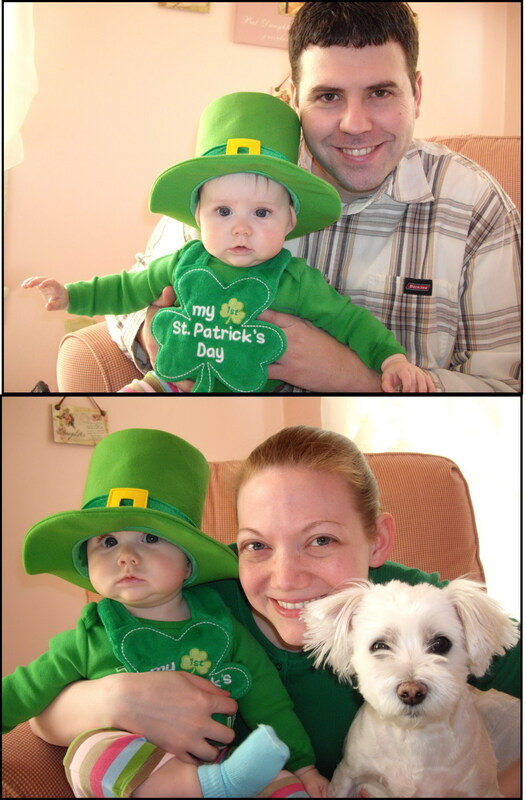 *The time that Buddy the Elf stole a picture from this blog post!